The season of Al Fresco cooking, eating and relaxing is upon us and nothing will impress your guests more than delicious pizza cooked outdoors. From Morso’s Outdoor Living range comes the Morso Forno outdoor oven, beautifully crafted out of heat retaining cast iron. As well as being perfect for roasting, baking and grilling, the oven’s design works in the same way as a pizza oven, allowing you to make the most mouth-watering and authentic tasting pizzas. The Morso Forno will not only take your outdoor cooking to a whole new level, it also provides a wonderful visual focal point for any patio or garden setting, and creates a glowing warmth for you and your guests. Fallen in love with the Morso Forno? 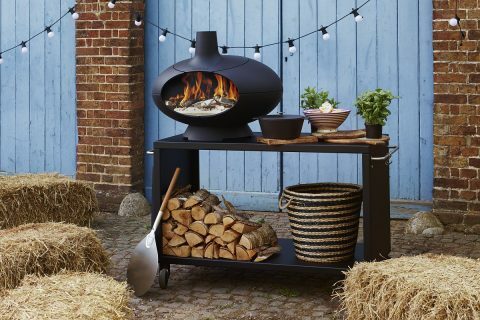 There are lots of must-have accessories to complement this remarkable outdoor oven available in our online shop. To help with a smooth pizza cooking experience don’t forget your pizza peel! Designed specifically for use with the Morso Forno Oven, the Morso Pizza Peel is ideal for placing and removing pizzas from the Morso Forno oven – it will slide easily underneath your pizza and support it perfectly so you can position and remove your pizza with ease – without your carefully prepared toppings falling into the embers! The handle is made of oak and the blade from aluminium. As well as creating delicious authentic pizzas, all the dishes you’ve dreamed of cooking out of doors will be enhanced using the Morsø range: barbecued meat and vegetables, grilled and baked fish and a variety of smoked dishes. 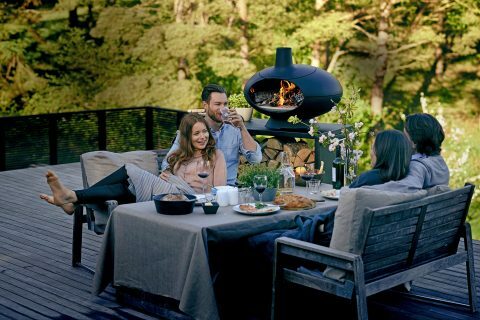 We have a fantastic range of Morsø Outdoor Living products in our online shop and offer free, next business day delivery if ordered by 12noon.